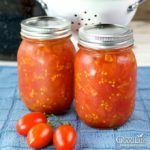 Canning your own diced tomatoes is an easy way to preserve an abundance of ripe tomatoes quickly. Canned tomatoes are handy to use in chilies, soups, stews, and casseroles. My goal each year is to grow enough tomatoes to preserve tomato sauce and salsa to last us a year. Since we have a short growing season, this means planting a lot of tomatoes in early summer. The fruit begin to ripen in August and continues until frost kills the plants in October. If the weather is exceptionally nice, the plants can produce a bumper crop. This is when things can get tricky. It is so easy to get overwhelmed when the tomato harvest comes in all at once. It is a busy time in the kitchen making and canning sauce and salsa before the next round of tomatoes are ready. There is only a small window available once tomatoes are ripe. If it is clear that I won’t be able to keep up with the tomatoes in baskets piled all over the kitchen, my strategy switches to survival… to get the tomatoes preserved in jars before they spoil. How to Peel Tomatoes: To peel the tomatoes, bring a large saucepan of water to a boil and fill a large bowl with ice water. 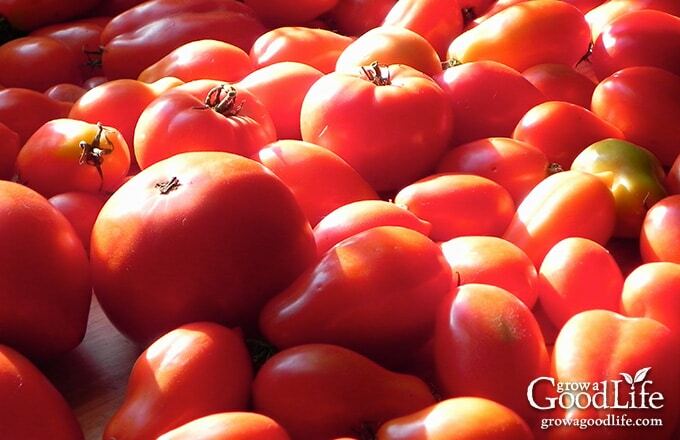 Dip your tomatoes into the boiling water until the skins crack and loosen – about 30-60 seconds. Remove the tomatoes from the pot and place in the bowl of ice water to cool. Discard the water and peel your tomatoes once they are cool enough to handle. Core and trim off any bruised or discolored areas. Dice or cut into quarters. Plus basic kitchen supplies such as a large sauce pot, large bowl, small pot, towels, knife, large spoon, potato masher, and a cutting board. Canning your own crushed or diced tomatoes is a quick way to preserve a bumper crop of ripe tomatoes. You can use the canned tomatoes in so many ways, including adding to chilies, soups, and casseroles. You can also substitute canned crushed or diced tomatoes for fresh in this tomato sauce recipe and tomato salsa recipe. Canning your own crushed or diced tomatoes is an easy way to preserve an abundance of ripe tomatoes quickly. Canned tomatoes are handy to use in chilies, soups, stews, and casseroles. Prepare your jars and lids by washing in warm, soapy water and rinsing well. Place the jar rack into the water bath canner, set the clean jars in the canner, add water, and boil jars for 10 minutes to sterilize. Warm your lids in a small pot over low heat. Keep jars and lids warm until they are ready to use. Wash your tomatoes in plain water. To peel the tomatoes, bring a large saucepan of water to a boil and fill a large bowl with ice water. 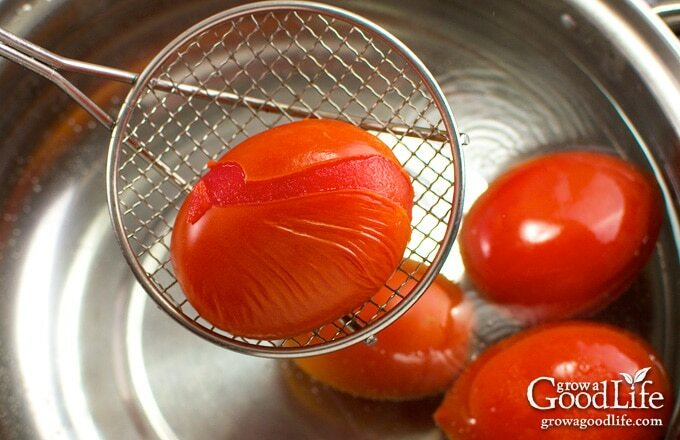 Dip your tomatoes into the boiling water until the skins crack and loosen – about 30-60 seconds. Remove the tomatoes from the pot and place in the bowl of ice water to cool. Discard water. Peel your tomatoes once they are cool enough to handle. Core and trim off any bruised or discolored areas. Dice or cut into quarters. Add about one pound (2 cups) of the prepared tomatoes to a large saucepan. Simmer on low heat until the tomatoes soften and release their liquid, about 5 minutes. Crush gently with a potato masher. Increase the heat to medium-high and bring the tomato juice to a boil. Stir frequently to prevent sticking. Once the tomatoes are boiling, gradually add remaining quartered or diced tomatoes and continue stirring for 5 minutes. No need to crush these, they will soften while cooking. Reduce the heat to low and keep warm. Spread a kitchen towel on the counter. Use your jar lifter to remove warm jars from the canner, drain, and line up on the towel. Add 1/4 teaspoon of citric acid or 1 tablespoon of bottled lemon juice to each jar. 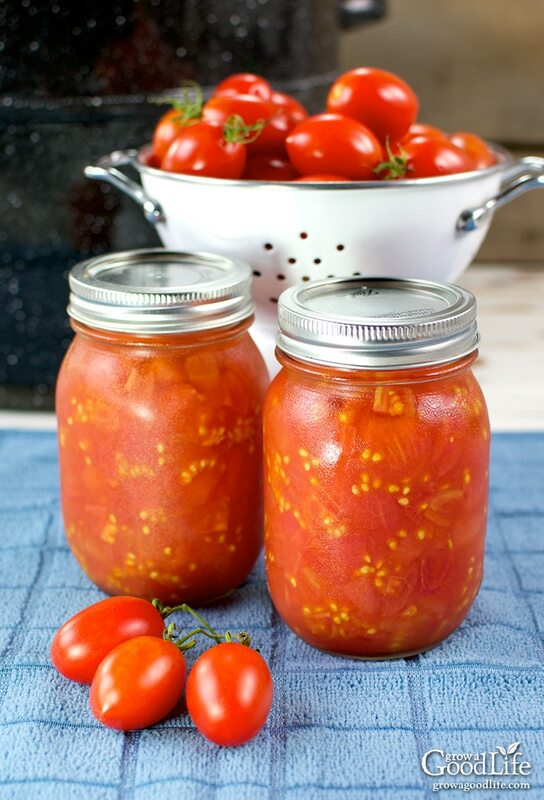 Use your canning funnel and ladle, fill the warm jars with hot tomatoes leaving 1/2-inch headspace. Use your bubble popper to stir through the jars to release air bubbles. Wipe the rims. Use your magnetic lid lifter to lift lids out of the warm water, center lid on the jar, and screw on band until it is fingertip tight. Using a jar lifter, place jars into canner leaving space in between them. Once jars are all in canner, adjust the water level so it is at least one inch above the jar tops. Add more hot water if needed so the water level is at least one inch above the jar tops. When adding water, pour the water in between the jars and not directly onto them. Use the hot water from the small pot your lids were in. Cover the canner and bring to boil over high heat. Once water boils vigorously, process pints for 35 minutes at altitudes of less than 1,000 ft. (adjust processing time for your altitude if necessary). When processing time is complete, turn off heat and allow the canner to cool down and settle for about 10 minutes. Spread a kitchen towel on the counter; remove the cover by tilting lid away from you so that steam does not burn your face. Use a jar lifter to lift jars carefully from canner and place on the towel. Allow the jars to cool for 12 to 24-hours. You should hear the satisfactory “ping” of the jar lids sealing. After 12 to 24-hours, check to be sure jar lids have sealed by pushing on the center of the lid. The lid should not pop up. If the lid flexes up and down, it did not seal. Refrigerate jar and use up within a few days. Remove the screw on bands and wash the jars. Label and date the jars. Store your jars in a cool, dark place and use within 12 months. Yields about 9 pint jars of crushed or diced tomatoes. Calories based on 1 cup serving. If you are canning diced tomatoes, do you heat the chopped tomatoes? This recipe seems to only cover crushed tomatoes. Thank you!! Yes, same instructions whether you are dicing or cutting into quarters (step3). Heat the tomatoes as explained in step 4.